The Yankees make it three straight wins in the Subway Series. 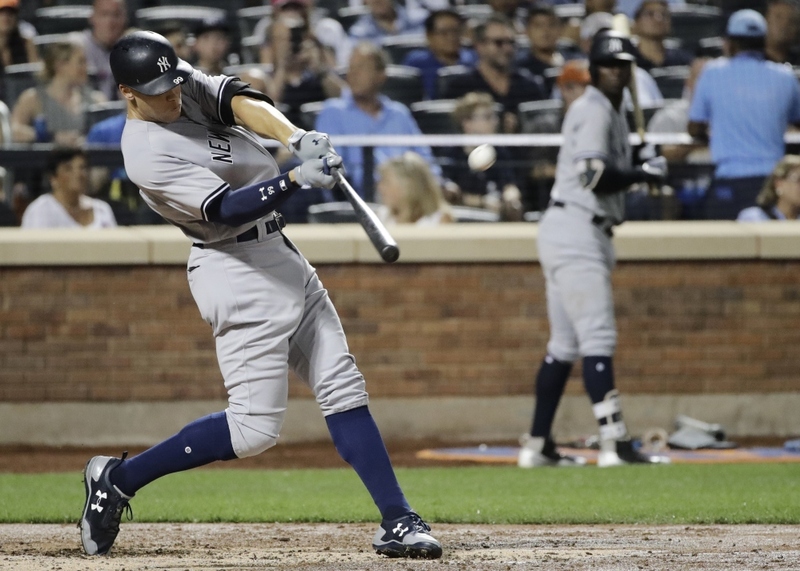 NEW YORK — Aaron Judge launched a titanic homer, Didi Gregorius snapped a seventh-inning tie with a two-run double and the New York Yankees beat the Mets 5-3 on Wednesday night for their third straight victory in the Subway Series. Oakland starter Chris Smith, 36, was in line Tuesday night for his first major league win since June 24, 2008 – when he was a reliever with Boston – but Santiago Casilla blew a lead by allowing three runs in the eighth inning. Casilla also blew a save and cost Smith a win on July 18 by allowing two runs in the ninth. Mets left fielder Yoenis Cespedes never even budged as Judge’s AL-leading 37th home run, projected at 457 feet, soared way over his head. The rookie slugger also singled and scored on Chase Headley’s sacrifice fly. But he struck out in the ninth inning to extend a dubious streak: Judge has fanned in 33 consecutive games, three shy of the record for a position player set by Adam Dunn from 2011-12. ANGELS 3, NATIONALS 2: Luis Valbuena and Kole Calhoun homered, Ricky Nolasco bounced back from a rocky first inning before exiting with an injury and the Los Angeles Angels won at Washington to split a two-game series. Tanner Roark (9-8) allowed four hits in seven innings for Washington, but was done in by the two home runs. Valbuena hit his 13th homer of the season to center to lead off the fifth, and Calhoun followed Mike Trout’s two-out infield single in the sixth with a shot into the second deck in right field. It was Calhoun’s 14th homer. BLUE JAYS 3, RAYS 2: Marcus Stroman pitched 6 1/3 innings, Steve Pearce homered and scored twice and Toronto won at home. Stroman (11-6) allowed two runs and six hits to beat the Rays for the first time in five career meetings at Rogers Centre. The right-hander entered 0-3 with a 6.38 ERA in four home starts against the AL East rivals. MARINERS 7, ORIOLES 6: Recently acquired Yonder Alonso hit his first homer for host Seattle and drove in three runs, and Marc Rzepczynski struck out Chris Davis with the bases loaded to seal a victory over Baltimore. Alonso, acquired in a trade with Oakland on Aug. 6, hit a two-run homer in the fourth inning, his 23rd of the season. He added an RBI single during a three-run fifth and also singled in the seventh. ROYALS 7, ATHLETICS 6: Alex Gordon hit a go-ahead RBI single in the ninth after Oakland tied it in the bottom of the eighth, and Kansas City won at Oakland. Alcides Escobar doubled to start the ninth against Blake Treinen (1-1), matching his season high with three hits. Then Gordon delivered his second run-scoring single of the series finale. PADRES 3, PHILLIES 0: Clayton Richard pitched a three-hitter for his first shutout since 2012 and Wil Myers stole three bases in an inning as San Diego completed a three-game sweep at home. BREWERS 7, PIRATES 6: Manny Pina hit a two-run homer in the eighth inning to lift host Milwaukee over Pittsburgh. Pina’s one-out shot to right field came off Pirates reliever Juan Nicasio (1-5). MARLINS 8, GIANTS 1: Giancarlo Stanton’s homer streak ended at six games, but he singled, stole a base and scored in a four-run first inning to help Miami win at home.